Todd and I had a wonderful time last weekend visiting family that was up from the states. It's always such a pleasure to have little kids around. I don't have any nieces or nephews, and rarely get to interact with children or babies...unless I am doing their radiology exam, which, is not so fun for either me or the child. Super sick children = super sad face. One of my cousins and her two little girls were up and as you can see we were greeted by a most darling little one who very formally welcomed us to "The Game Party". Where we of course played games together and ate lunch, as you can see below. This little munchkin is my particularly favorite munchkin in the entire world. She was also our flower girl and is one of the most exceptionally well-mannered persons (young or old) I've ever met. When asked if she was excited at the prospect of "throwing the flower petals" at our wedding, she responded that she would not throw them but infact "lightly toss them", no joke. She was like, four years old at the time. I'm absolutely confident that at that age I was picking my nose and playing naked in the dirt under the porch, painting rocks and making mud cakes. Below, for your viewing pleasure, is THE most adorable photo of Todd and his enchanting little playpal. She's so cute I can hardly stand it! OMG, look at that face. Just look! Hehehe. That is the face of utter delight. Interestingly, that was also my face when I ate these burgers I made a few days ago. These are the fruition of an abundance of edamame that I purchased, trying to pump my wee body full of iron. This is a flavorful veggie burger with fresh edamame and greens, rolled oats, tender sweet potato, and creamy tahini for a unique dish. I love to freeze the leftovers for a quick and effortless meal. A flavorful veggie burger with fresh edamame and greens, rolled oats, tender sweet potato, and creamy tahini for a unique dish. Heat the olive oil in a large rimmed frying pan over medium. In a food processor, pulse the onion and garlic until finely diced. Add the mixture to the pan and saute for about 5 minutes.Meanwhile, pulse the sweet potato in the food processor until finely diced. Add to the frying pan.Pulse the shelled edamame in the processor until finely diced. Add to the frying pan. Saute the vegetable mixture for about 10-15 minutes, over medium-high heat, until all the water is evaporated and the sweet potato is tender. You want the mixture to start sticking to the bottom. Now, pulse the oats in the food processor until roughly ground. Add to the vegetable mixture and stir to combine. Whisk together the remaining ingredients in a small bowl until smooth. Stir into the vegetable mixture until very well combined and remove from heat. Heat a cast iron skillet with a dash of olive oil over medium-high heat. Form 1/4 cup of the burger mixture into a patty and brown on each side for a couple minutes. Repeat with remaining burger mixture.Serve hot. I like mine with BBQ sauce! Freeze any remaining patties for use later. I'm not really big on vegan burgers. Of any kind. Homemade, store-bought, restaurant. I have nothing against the vegan burger. I'm pretty sure it just has something to do with my disdain for sandwiches. I'll just say it...I don't like sandwiches. I know. Am I even human? I don't know anymore. Well, these Thai Quinoa Burgers, if only for a moment in time, make me forget how much I don't prefer an entree squished between two wads of bread. These are the freakin' bomb, people. They're just as a vegan burger should be. Delicious, hearty, full of flavor, and they stay together beautifully. There's nothing worse than a crumbling vegan burger patty, truly. 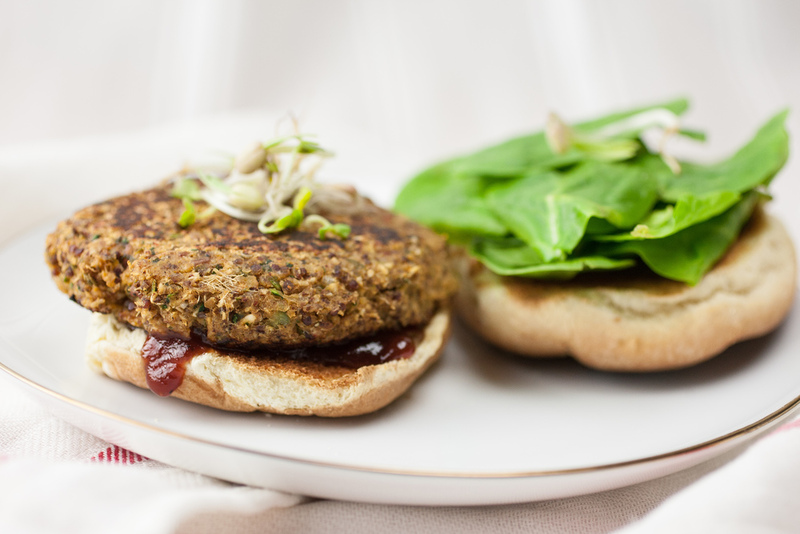 What I especially love about these burgers is that they are very healthy, super easy to make, hold together well, protein-packed, crispy on the outside, and not at all dry. What's not to love? You have to try these! My new favorite vegan burger. Notes: You'll have a bit of leftover quinoa. That's a good thing! I put mine in the freezer and then when we need it, you're already good to go! In a small bowl, whisk together the ground flax and water. Set aside to rest for at least 10 minutes. In a medium saucepan, bring the rinsed quinoa and water to boil over high heat. Turn down to a simmer, cover and allow to cook for about 15-20 minutes or until tender. Fluff with a fork and set aside. 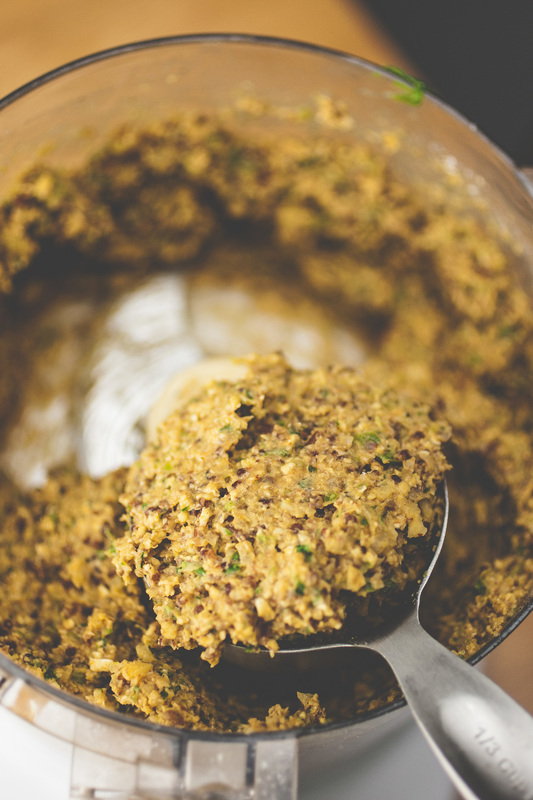 In a food processor, pulse the oats until they are coarsely ground. Add the remaining patty ingredients, including the flax egg. Process well, until smooth and thick. Once the quinoa is done cooking, measure out 1 cup and process that in as well, until well combined. Freezer or refrigerate the leftover quinoa. Preheat oven to 350 F and coat a baking sheet with a non-stick cooking spray. Heat a large frying pan over medium heat with a splash of olive oil. Using a 1/3 measuring cup, form the burger mixture into patties and fry for 1-2 minutes on each side, until browned. Repeat until all the mixture is gone. This should make about six patties. Once they are browned on both sides, place on the baking sheet and bake at 350 F for about 10 minutes, until golden and crispy. 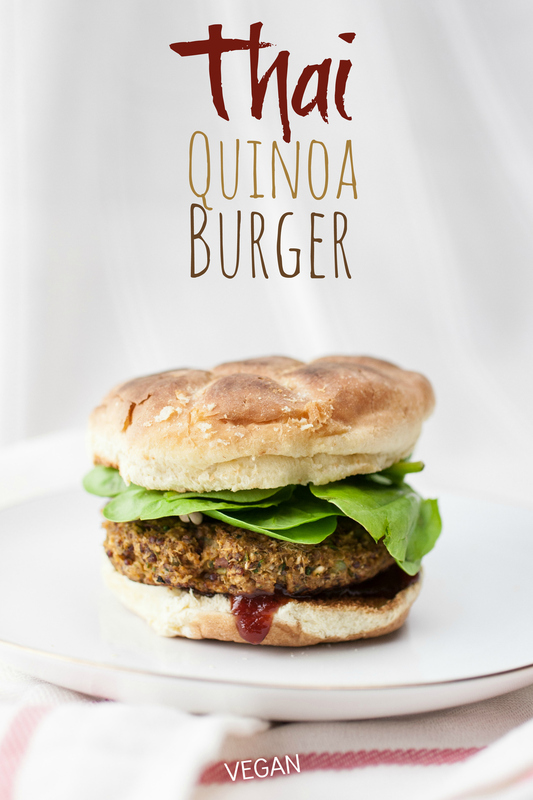 Assemble with a bun, and topped with BBQ sauce, spinach or lettuce, and sprouts if you wish. Or, it's just as fabulous without the bun! They'd be great in a wrap too, I should think! Bonus points for sprouting your own mung beans, like I did. I'll try not to be too excited or smug about that. In all honesty, I had no choice. Our stores up here in Alaska don't sell them anymore!